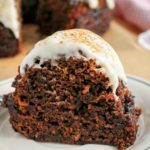 A deep, dark gingerbread bundt cake with a tangy cream cheese frosting, perfect for the holidays or for any time in winter when you need some comfort. Preheat your oven to 350 degrees F. Very generously butter a 12-cup bundt pan and set aside. Don't skip this - this is a very sticky cake. In a large saucepan, bring stout and molasses to a boil. Remove from heat, whisk in baking soda (note it will begin bubbling vigorously), then cool for a few minutes (to just above room temperature, so you don't cook the eggs when you mix it in later). In a medium bowl, whisk together the flour, baking powder, and spices. In a separate large bowl, whisk together the eggs and both sugars. Whisk in canola oil, then cooled molasses mixture. Finally, add the flour mixture and stir together (or fold with a spatula) until just combined. Pour batter into the prepared bundt pan and tap it on the on counter a few times to eliminate air bubbles. Bake the cake until a toothpick comes out with just a few moist crumbs attached, about 50 minutes. Cool cake COMPLETELY in pan on a rack. Run a butter knife or spatula along the outer and inner edges of the cake, and turn out onto a plate. In a large bowl, using an electric hand mixer, cream together the cream cheese and butter until fully combined and fluffy. Beat in sugar and salt until fully combined. Add milk, 1 tablespoon at a time, until the frosting is still thick but pourable (it took about 5 tablespoons for me). Pour frosting evenly over the cake. Dust with cinnamon, if desired. Store in the fridge for up to 5 days; this cake gets better as it sits. Bring to room temperature before eating. Adapted from Smitten Kitchen's rendition of the Gramercy Tavern gingerbread recipe. Find this and more delicious recipes at www.katiebirdbakes.com!